If you are visiting campus and don't have a Husky Card, purchase a Dawg Prints Card from one of our convenient dispensers located on campus. The Dawg Prints card works just like the Husky Card and may be used at many locations that the Husky Card is accepted on campus. Dispensers dispense only $5.00 (includes $.20 for card and $4.80 actual value) Dawg Prints cards. Users will have $4.80 to use for copying and printing. Users will need either $1 bills or a $5 bill in order to purchase new cards. The CMU Copy Center (Communications B042) accepts checks or credit cards for purchasing of new Dawg Prints cards. Value can be added the Husky Card by going online at http://hfs.washington.edu/husky_card/ or by going to the Husky Card ID Center located on the ground floor of Odegaard by By George. 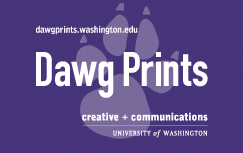 Value can be added to the Dawg Prints card at add value stations located in Allen North Lobby, Law Library, Odegaard Second Floor and UW Bothell and UW Tacoma libraries. Value can also be added at the HUB Ticket Office as well as the Husky Card ID Center, located on the ground floor of Odegaard next to By George. Note: After 24 consecutive months of inactivity, accounts with a balance of less than $5.00 will be charged $1.00 per month of continued inactivity, and accounts with zero balances will be closed.